The Skinny: Average Hong Kong film mixing triad action with manufactured sentimentality. 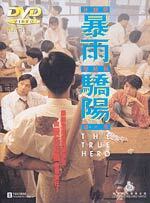 by Kozo: Simon Yam is an ex-triad ex-con trying to go straight by becoming a high school teacher. But he can’t because “everytime he tries to get out, they pull him back in!” Yes, this is a variation on the Lean on Me formula where one unlikely man steps in and reforms the educational system. Well, Simon doesn't actually reform the educational system, but he inspires the kids which is damn good enough for most people. Anita Yuen is his girlfriend/moll, who supports him even though she can’t understand why he would ever want to teach high school. Banana Ripening boy John Tang appears as one of Yam’s students, who’s in danger of joining a triad and following the same path Simon has.